A Gallant Soldier from South America . . . Most of the American plant species considered invasive, and which I prefer to consider immigrants, came to this country from Europe and, to a lesser extent, Asia. One region not so well represented by established wild flora is the continent of South America. 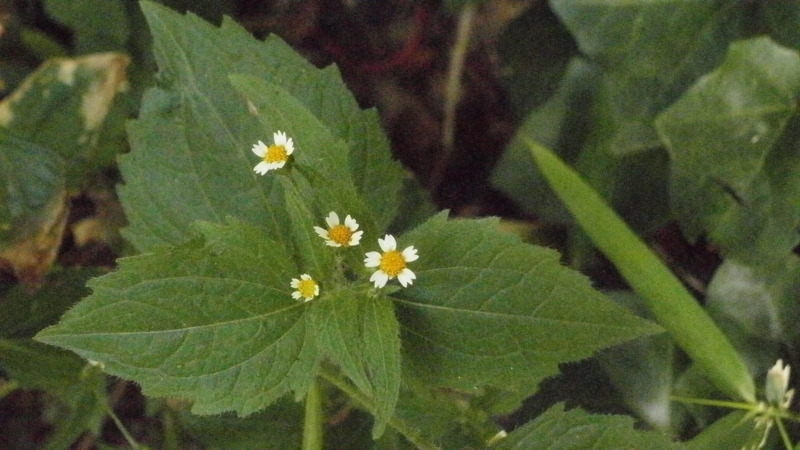 Enter the “gallant soldier” (Galinsoga parviflora), also known as quickweed. This pretty little plant is a diminutive daisy from Peru. It is called Guasca in Columbia, where it is a popular herbaceous plant, and Mielcilla in Costa Rica. The species has made its way to Great Britain as well, and from there the gallant soldier name was derived. A member of the Asteraceae family, the plant prefers moist soil and will be often found growing in tree pits and flower boxes on shady blocks. Patches of the blooming plant seem to appear overnight in New York City by late May (quickweed, indeed!) and continue on until the first frosts of the fall season. Part of its street smart success is due to the fact that it is self-fertile; it’s flowers are hermaphrodite. The blossoms themselves are a delightful study of beauty in a small space. The diameter of an individual bloom is no greater than the capital letter O on a computer keyboard. 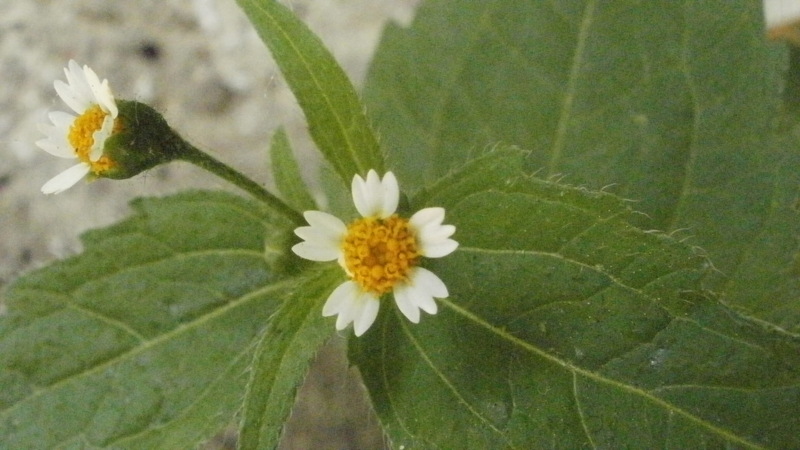 Each flower resembles an egg yolk ringed by five white petals that are triple lobed and resemble the capital letter W.
The light green leaves are ovate in shape and supported by stems that are relatively smooth: two identifying features that can be used to differentiate the gallant soldier from its more slender and hairy cousin, fringed quickweed, or shaggy soldier (Galinsoga quadriradiata). 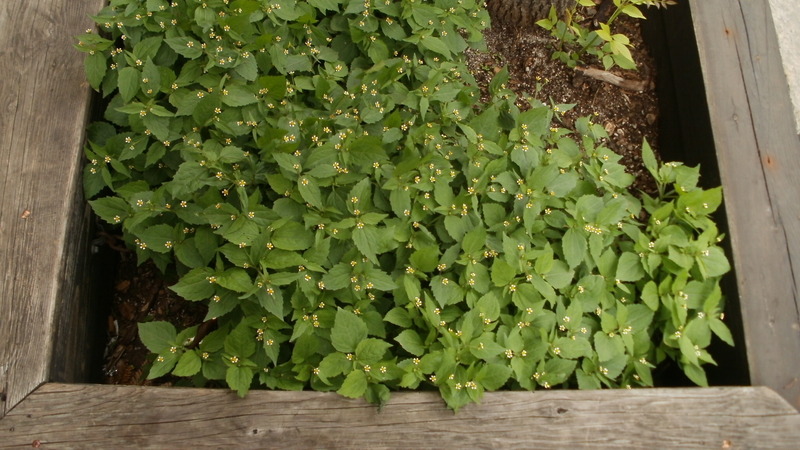 Like many of the leafy green invasive weeds – or immigrant wildflowers – of the West Village, the gallant soldier is edible. Stems, leaves, and flowers of the plant will all simmer well within soups and stews and are a central flavoring ingredient to a Columbian potato soup called Ajiaco. The leaves will stand alone raw and can be incorporated with ease into a summer salad. This South American daisy is not only dainty, it is delectable.